"*SPOILER ALERT! 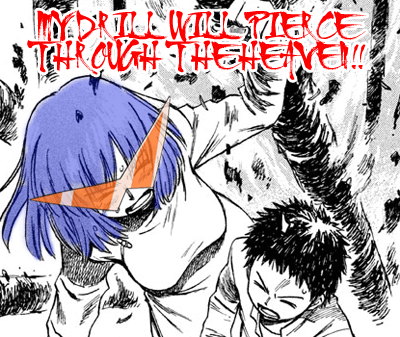 KAMINA IS-- *silenced by staffs*"
Btw, this one ALSO HAS LOLI but she doesn't appear yet in this chapter 1. Just wait guys~ I'll never take a project with no loli in it~! She's a cutie too. Dang it, my armpit fetish is going sky high. And, this new project has some kind of gore in this. I don't really recommend this for children, but adults (and maybe teenagers) might enjoy this one. Oh yeah, one more thing. I'm changing our alternate download link to POMF.SE instead of Sendspace because Sendspace often delete our stuffs. The only bad thing is that POMF will randomize the name of the zip file, but the folder inside should be fine. Don't worry, the gore really isn't that bad. I mean, okay the actual actions are pretty grisly, but it isn't presented in a very shocking manner imo. It has manny things: Cute girls, evil grins, Zombies, etc. Not really my taste, but I can say it's pretty awesome. That's a huge effort, Good work guys!